The following studies have been completed over the past 20 years. My research has used a variety of methods including observation with field investigations, experimental designs with controlled settings, and interviews with young children. The brief summaries of the studies give an idea of the impact that the design of children's settings has on children's development. Please see the entire article as listed for further information. Circular and spherical forms were discussed by preschoolers as preferences in the classroom. Girls preferred the classroom with organized display areas more than boys. 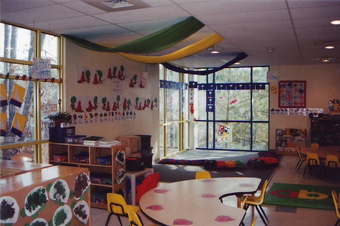 Additionally, children liked the environment with more décor and materials over the classroom with more open space. Read, M. A. (2010). Contemplating design: Listening to children's preferences about classroom design. Creative Education, 1(2), 75-80. 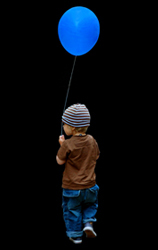 Preschool children were interviewed for their color preferences across the spectrum of colors. Children did not prefer warm colors (red, orange, and yellow). Cool colors on the whole were preferred over warm colors. Boys and girls both preferred red, however, purple was also noted as a preferred color. Read, M. A., & Upington, D. (2009). Young children's color preferences in the interior environment. Early Childhood Education Journal, 36(6), 491-496. The exterior designs of preschools were investigated for features that reflect a home-like environment, such as a one-storey building, a brick facade, landscaping, or a gabled roof. 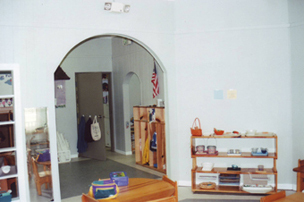 Many preschools were designed with home-like features incorporated into the exterior design. Read, M. A. (2007). 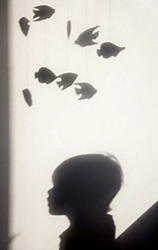 Sense of place in child care environments. Early Childhood Education Journal, 34(6), 387-392. 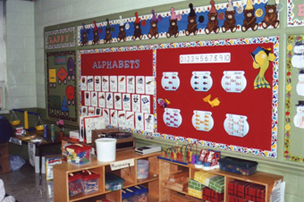 This study focused on how color was used in 101 preschool classrooms in the state of Alabama. The findings showed that while accents of warm color were seen in the majority of the spaces, most of the settings had white, grey, or off-white walls. Read, M. A. (2003). 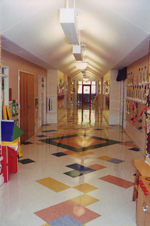 Use of color in child care environments: Application of color for wayfinding and space definition in Alabama child care centers. Early Childhood Education Journal, 30(4), 233-239. The cooperative behavior of preschoolers was investigated by changing the color of the wall and the ceiling height within a small room. 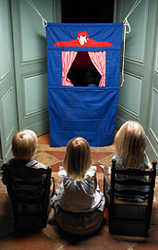 Children demonstrated more cooperative behavior in the space with a red wall or a lowered ceiling than in the space with all white walls and a standard height ceiling. Read, M. A., Sugawara, A. I., & Brandt, J. A. (1999). The Impact of Space and Color on Preschool Children's Cooperative Behavior, Environment and Behavior, 31(3), 413-428. On-site observations were completed of 20 preschools in Southern California. The objective was to determine if spaces designed to be used as preschools were completed with design features thought to promote children's feelings of security and self-esteem. 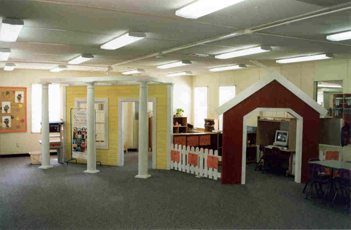 Preschools designs adapted from buildings designed for other uses were observed for comparison. Read, M. A. (1992). Physical Design Features Supportive of Children's Security and Self Esteem in Preschool Classrooms. Unpublished Manuscript, CSU, Long Beach.